Cyber Monday game deals are drawing to a close, but there’s still time to grab a sweet discount on a nice 4K TV if you aren’t all shopped out. Right now, you can get the TCL 55R617 55-Inch 4K Ultra HD Roku Smart LED TV for $630 at Amazon, down 21% from the TV’s standard $800 price point. 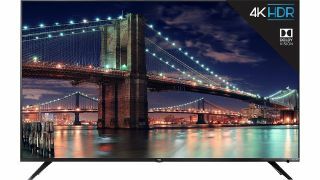 As with the LGSK8000, which was on sale for Black Friday, the 6-series offers the affordable version of 4K. No, you won't get the deepest blacks, but you will get 4K resolution at a price that, until last year, would've seemed preposterous. Based on our testing, the 6 series has very little input lag, which makes it an especially good TV for gaming. So if you’ve been considering making the jump to 4K, maybe break out that credit card one last time and prepare to take advantage of that Xbox One X or PS4 Pro you’ve been eyeing. Speaking of which, there's still time to check out the best US Cyber Monday console bundles before it's too late!